Spray a 9 x 13 pan and place peaches in a single layer on bottom. Mix eggs, evaporated milk, 2 % milk, vanilla, almond extract and 2 tablespoons sugar and beat well. Mix bread cubes into the egg batter. You want to use just enough cubes that they are saturated and you have some liquid left. Spoon over peaches. Meanwhile in a medium saucepan, melt the butter, mix in corn syrup and brown sugar and bring to a simmer over a medium heat, stirring constantly. Remove from heat and stir in almonds. Drizzle evenly over bread mixture. Cover with foil and bake at 350 degrees for about 40 minutes. Remove foil and continue baking until center is set. (Test with a knife – if no egg batter runs out it is done. 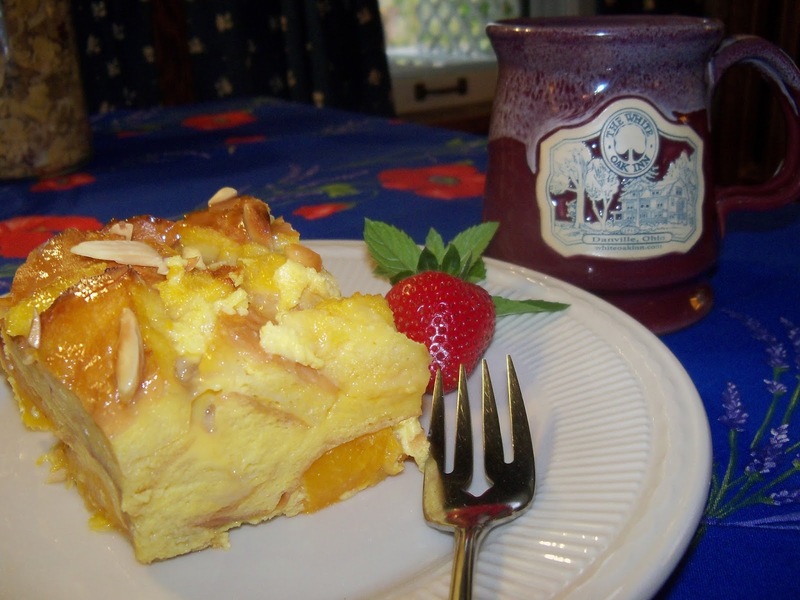 This entry was posted in Desserts, Fruit, The White Oak Inn by admin. Bookmark the permalink.